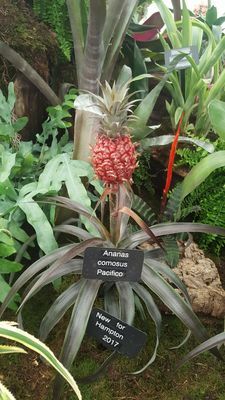 Ananas comosus is a seedless cultigen (a plant that has been altered by humans through a process of selective breeding). Because it has been in cultivation for thousands of years, its exact origins are unknown. 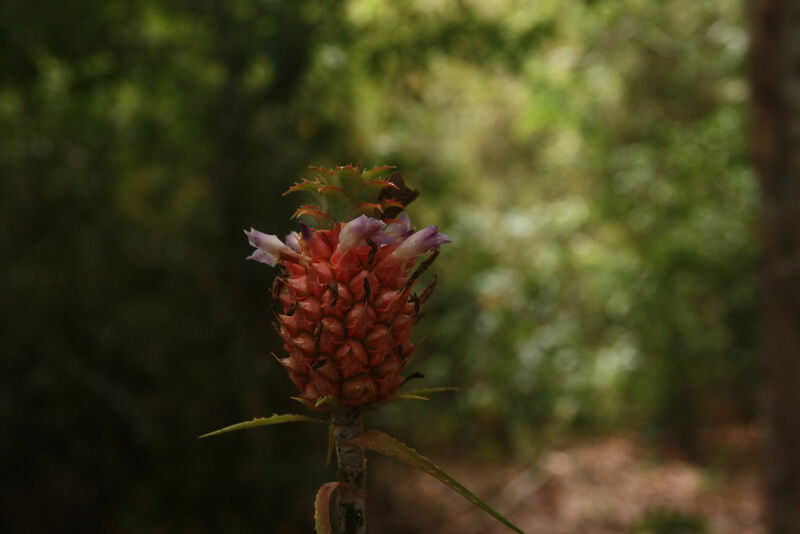 It is thought to be derived from bird-pollinated wild plants with seeds in Central and South America, perhaps from wild relative Ananas ananassoides, but further research is needed to confirm this. The Tupi-Guarani Indians of South America have been credited with its domestication, although this is in some dispute. In the horticultural trade, many species and hybrids of Bromeliaceae are sold as indoor ornamentals, but pineapple is the only economically important plant in Bromeliaceae. The family also includes 'air plants' (epiphytes) such as Spanish moss (Tillandsia usneoides) and blushing bride (Tillandsia ionantha). 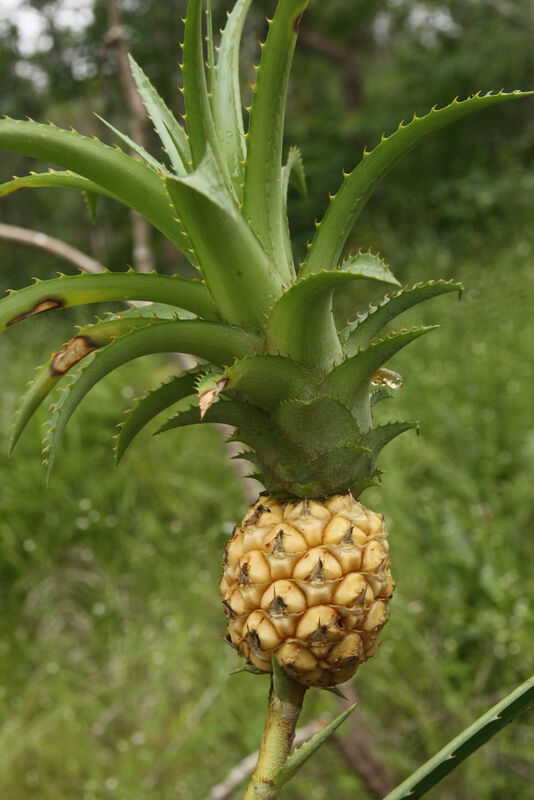 There are nine accepted species of Ananas. Ananas comosus is a cultigen from southeastern and southern Brazil and Paraguay, the wild relatives of which are unknown. Overview: Tropical herbaceous perennial, 1-2 m tall and wide with leaves spirally arranged. Stem: Circular in cross-section, up to 50 cm long and 8 cm wide, club-shaped. Leaves: Deep green to grey-green to red, pungent, 30-50 in dense rosettes. Individual leaves up to 1 m long by 4 cm wide with spiny margins. Flowers: Borne on an inflorescence (flowering structure) 20-30 cm long, held on a scape (stalk) up to 50 cm long and subtended by bracts. Small purple or red flowers are each accompanied by a single red, yellowish or green, fleshy bract. Each flower is composed of three sepals, three petals, six stamens and a three-chambered ovary. Fruits: A seedless, juicy syncarp (multiple fruit, produced by fusion of fruits from 100-200 flowers) up to 30 cm long, crowned with 20-30 leafy bracts. The tough, waxy rind, made up of hexagonal units, is dark-green, yellow, orange-yellow or reddish when the fruit is ripe. The flesh ranges from nearly white to yellow. Seeds: Normally only traces of undeveloped seeds are present. Offshoots, known as 'slips', emerge from the stem around the base of the fruit and 'stem shoots' grow in the axils of the leaves. 'Ground shoots' or 'suckers' are shoots arising from the base of the plant at ground level. 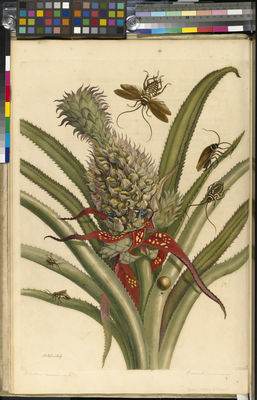 Pineapple was (and still is) an important part of the diet of native Americans in the lowland tropics. The names nanas and ananas were used throughout South America and the Caribbean. Native Americans ate the fresh fruit and also used it to prepare alcoholic beverages such as pineapple wine, chicha and guarapo . 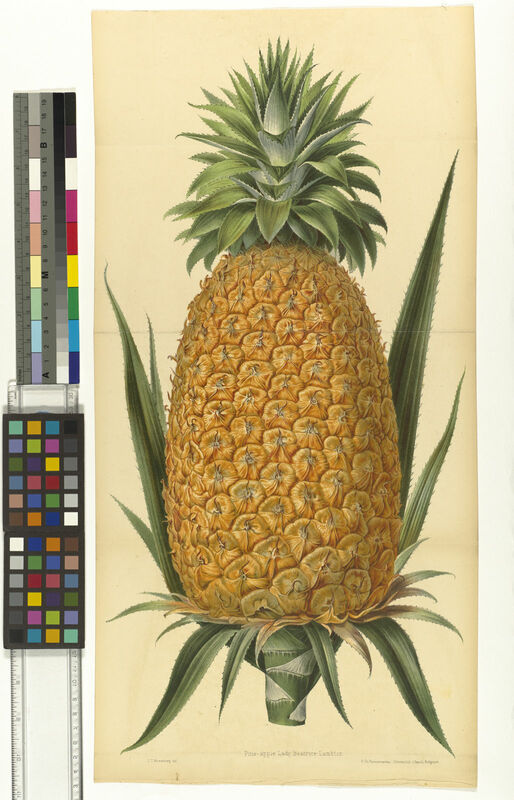 Today, pineapple is the world's third most important cultivated tropical fruit after bananas and citrus. It is grown in frost-free areas around the world for its fruits, which are highly regarded for their distinctive flavour and sweet flesh and juice. Pineapple is an excellent source of vitamins A and C and potassium. About 30 cultivars are grown commercially and these are grouped into four main classes for convenience in trade: 'Smooth Cayenne', 'Red Spanish', 'Queen' and 'Pernambuco'. 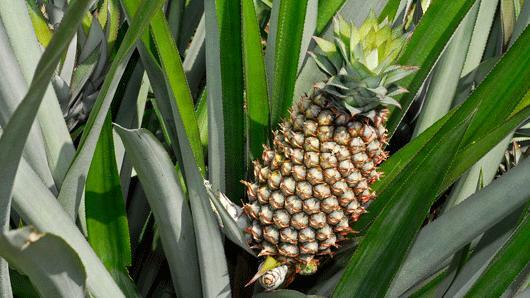 Seventy per cent of the pineapples produced globally are consumed as fresh fruit in the country of origin. 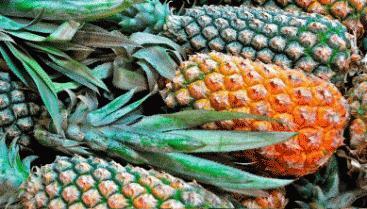 Some of the largest producers of pineapple are Thailand, the Philippines, Brazil, China and India. Pineapple is also an important crop in Hawaii, Malaysia and Kenya. Major pineapple products in global trade are canned slices and chunks, crush, juice and fresh fruit. 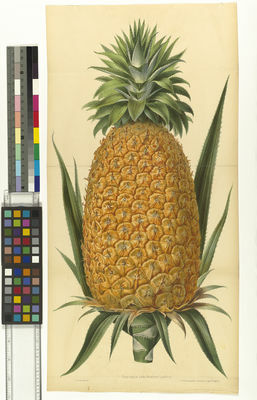 Cut pineapple is eaten alone or used in desserts, salads, fruit cocktail mixes and cooked meat dishes. Pineapple juice is used in beverages - most famously the mixture of pineapple juice, rum and coconut cream known as piña colada. 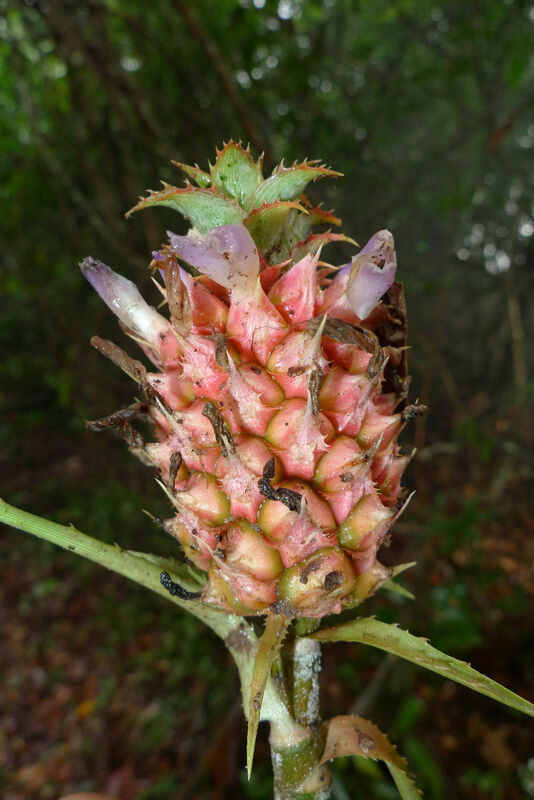 Native Americans have used pineapple medicinally against parasitic worms and amoebic parasites, to treat stomach complaints and to induce abortion and stimulate menstrual flow. Most of these uses relate to the presence of the enzyme bromelain, which breaks down protein. 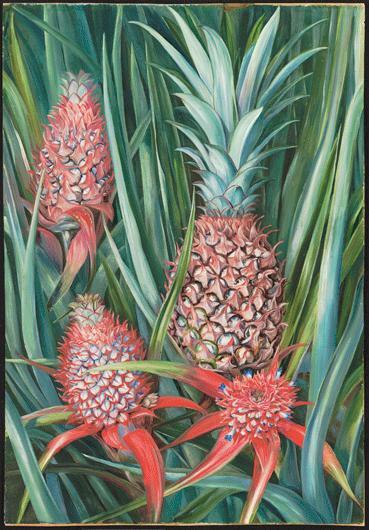 Bromelain extracted from pineapple has been used as a nutraceutical (food product thought to provide heath benefits). It has been shown to interfere with the growth of malignant cells, to inhibit clotting, reduce inflammation and help remove damaged tissue from wounds. Many people react to fresh pineapple with an outbreak of a skin rash or hives. External exposure to juice alone can also cause this reaction in some people. Those who react this way should reduce intake of uncooked fruit or eat only canned fruit. 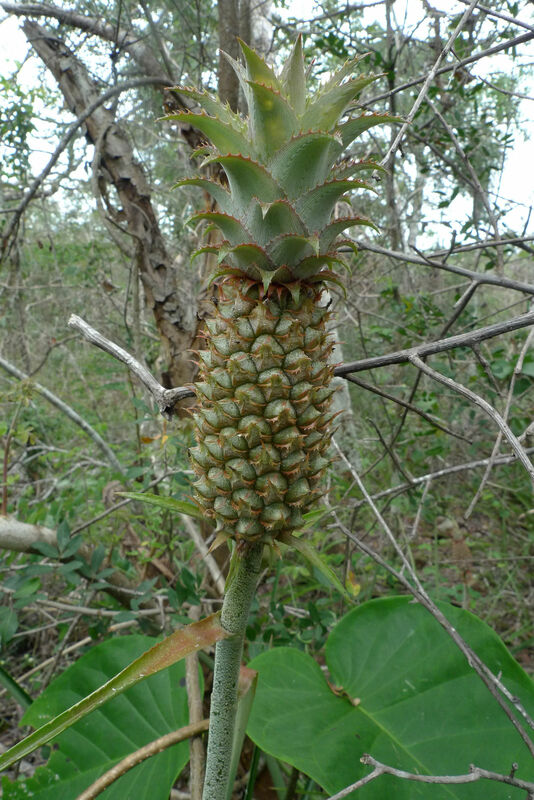 Native Americans used the fibres contained in pineapple leaves and domesticated a smooth-leaved form ( curagua ) with a higher yield of long, strong fibres. These were used to make fishing nets and lines, hammocks and loincloths. 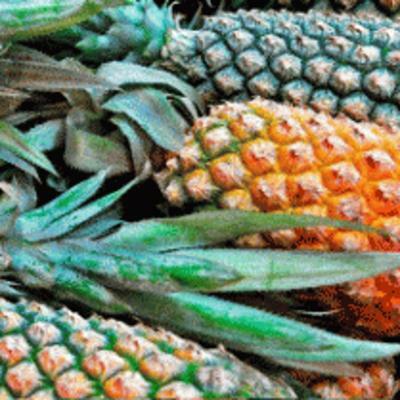 Pineapple fibre is creamy-white with a silky shine and is delicate in texture. 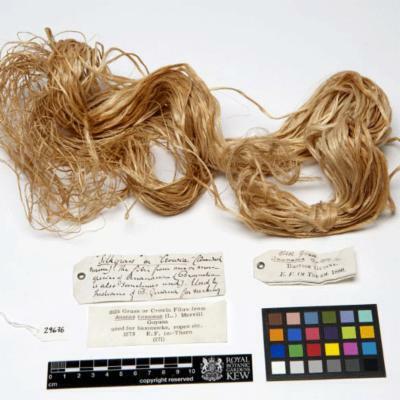 It is still used in Brazil and the Philippines, where it is known as piña cloth. It is exported from the Philippines and Taiwan to Spain where it is used for fine embroidery. Pineapple fibre easily takes and retains dyes and is strong and soft and has been used to make smooth, thin, pliable paper. 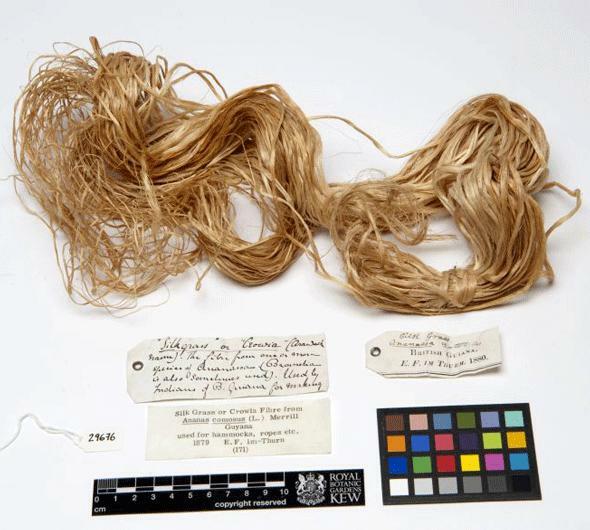 It is used by cottage industries rather than on a commercial scale, partly because the fibre is difficult to extract and also because the cultivars grown for food do not have leaves suitable for fibre extraction. Pineapple is cultivated as an ornamental, serving as a stately foliage plant or as a curiosity (with the tempting promise of edible produce). The variegated form is popular as an ornamental. 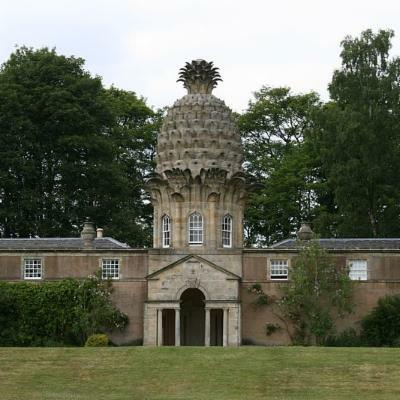 It was considered fashionable to grow pineapple in Great Britain in the early 1700s, and it served as the model for much garden statuary. 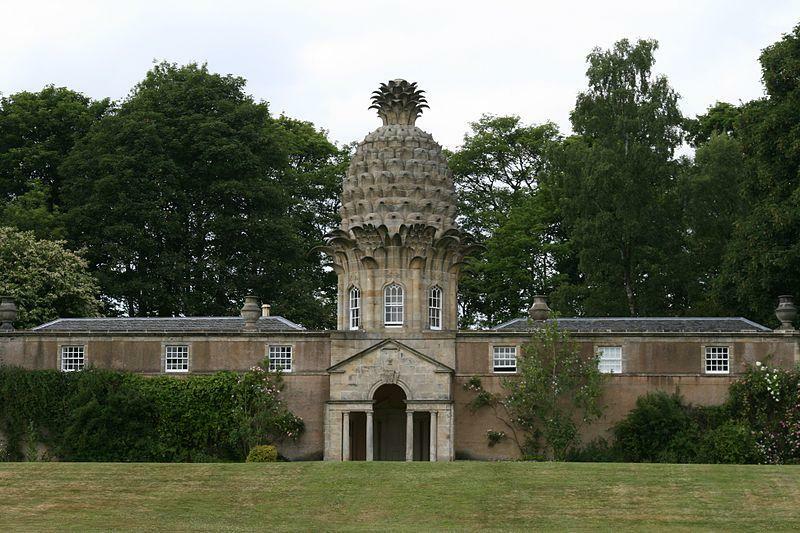 An impressive example of pineapple-inspired architecture can be seen at Dunmore Park in Scotland. Built in 1761 by John Murray, the 4th Earl of Dunmore, this folly with its pineapple-shaped cupola originally contained a hothouse but is now maintained as holiday accommodation by The Landmark Trust. 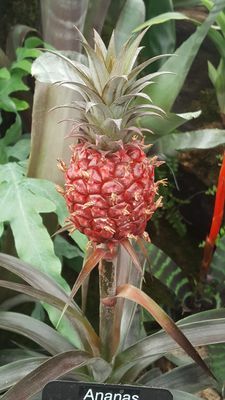 In temperate regions pineapple should be grown in a glasshouse or conservatory, with a minimum temperature of 13-15°C, high humidity and strong sunlight. Plants will not normally produce fruit until they are three years old. Bromelain (an enzyme that breaks down protein) extracted from pineapple has been used as a meat-tenderiser. 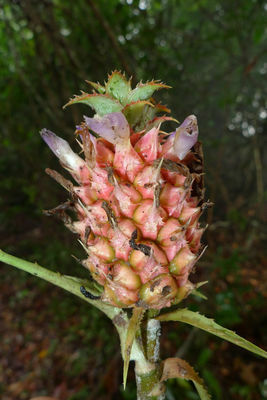 By-products of pineapple processing (leaves, bracts, fruit trimmings) have been used in animal feeds, although they are often of low nutritional value. 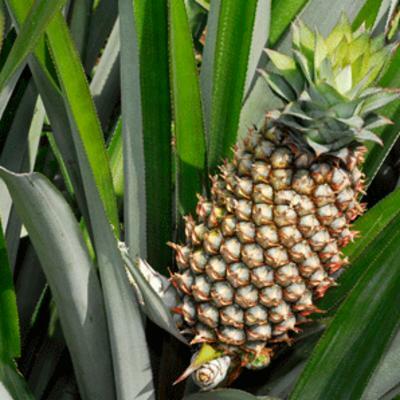 Pineapple originated in the lowlands of South America. It was widely used by Native Americans for food, alcoholic beverages and medicinal purposes. 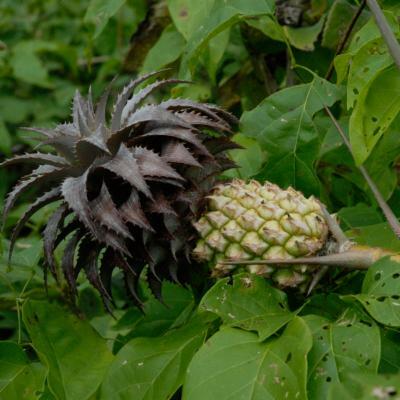 By the 15th century, it was distributed throughout most of tropical America, and all forms in cultivation were nearly or completely seedless. Pineapples were first seen by Europeans when the Italian explorer Christopher Columbus landed on the island of Guadeloupe during his second voyage in 1493. 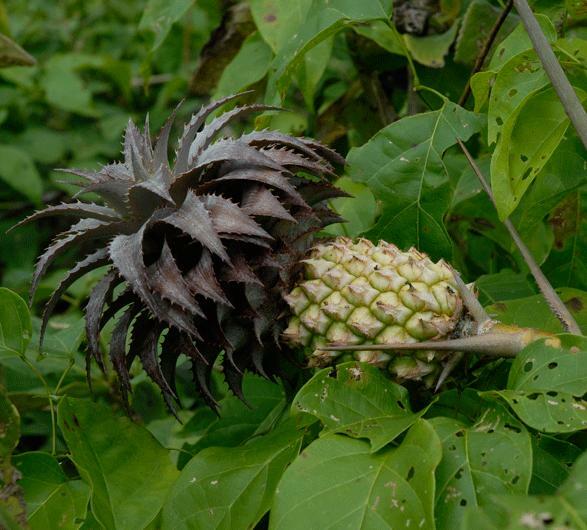 Columbus is alleged to have named the fruit, calling it the 'pine of the Indies' due to its resemblance to a pine cone. 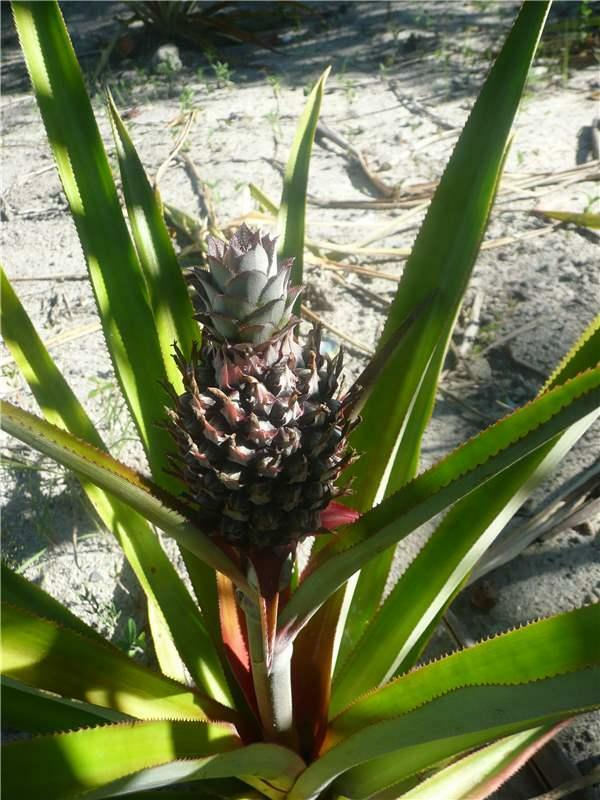 The name Ananas derives from nana , a Tupi Indian term for the fruit. 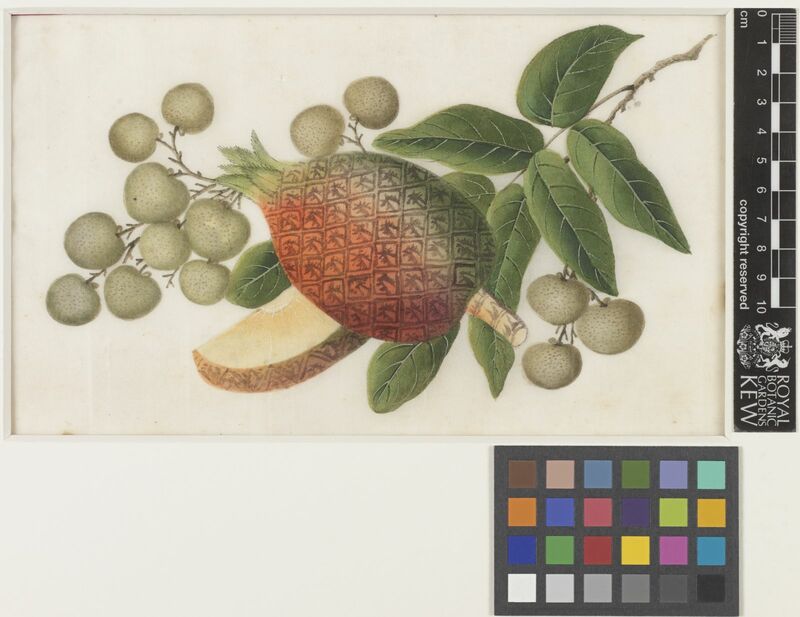 The value of this fruit was soon recognised, and before the end of the 16th century pineapple cultivation had spread across much of the tropical world, including Africa, India, China, Java and the Philippines. 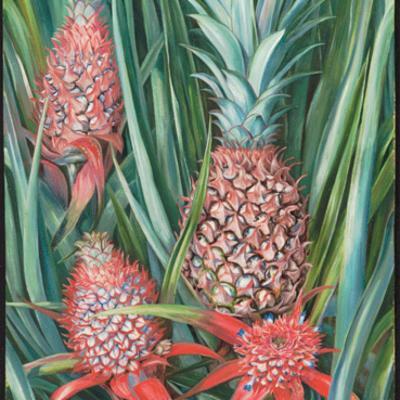 In the late 18th century, pineapple was introduced to Hawaii, where it has become the state's most important fruit crop. Pineapple is now considered to be a weed in some countries. 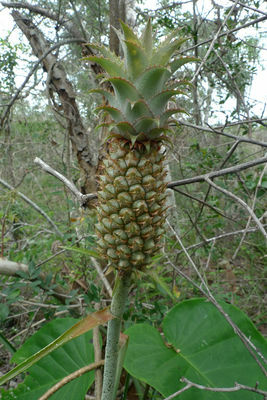 Pineapple is propagated vegetatively by rooting the coma (crown of bracts at the top of the fruit) or from side shoots produced at the base of the growth. Pineapple can be seen growing at the northern end of Kew's Princess of Wales Conservatory, in the moist tropics zone. 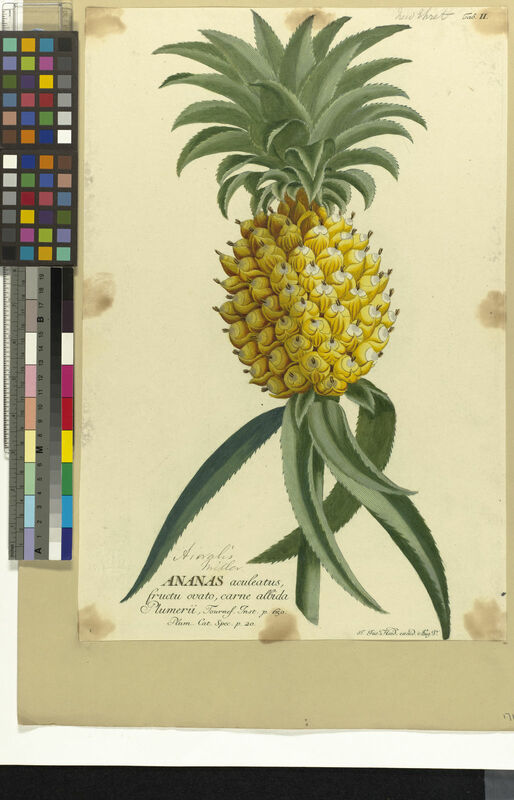 Pineapple fibre, thread and cloth and an evening bag and a shirt made from it are held in Kew's Economic Botany Collection. 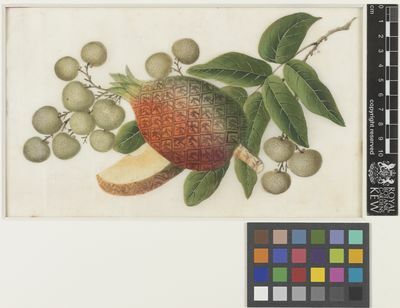 Specimens of pineapple fruit, leaves and oil are also held in the collection and are available to researchers by appointment. 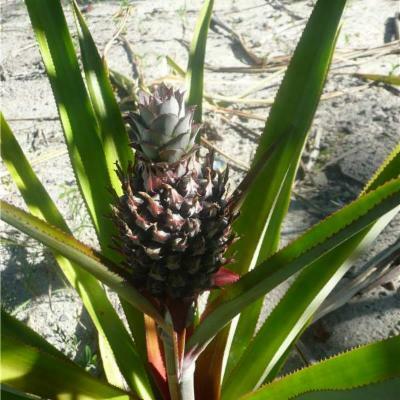 Consumption of unripe fruit can cause irritation to the throat and act as a strong purgative; some people have a strong skin reaction (hives) after consumption of fresh pineapple. Cultivada en Colombia; Alt. 0 - 2000 m.; Amazonia, Andes, Guayana y Serranía de La Macarena, Islas Caribeñas, Llanura del Caribe, Orinoquia, Pacífico, Sierra Nevada de Santa Marta, Valle del Cauca, Valle del Magdalena. Leaves - Used to make cord (Linares et al. 2008). Food and drink, medicine, textiles. Ananas comosus var. microstachys (Mez) L.B.Sm. Timberlake, J.R. & Martins, E.S. (eds.) (2010). Flora Zambesiaca 13(2): 1-83. Royal Botanic Gardens, Kew. Smith, A.C. (1979). Flora Vitiensis Nova. A new flora for Fiji (Spermatophytes only) 1: 1-495. Pacific Tropical Botanical Garden, Lawai. Paull, R. E. & Duarte, O. (2011). Tropical Fruits, Volume 1, 2nd Edition. CABI, Wallingford, UK. d’Eeckenbrugge, G. C., Sanewski, G. M., Smith, M. K., Duval, M. & Leal, F. (2011). Chapter 2: Ananas. In: Wild Crop Relatives: Genomic and Breeding Resources, Tropical and Subtropical Fruits, ed. C. Kole, pp. 21–41, Springer, Berlin, Heidelberg. Mabberley, D. J. (2008). Mabberley’s Plant-book: a Portable Dictionary of Plants, their Classification and Uses, 3rd Edition. Cambridge University Press, Cambridge, UK. Bartholomew, D. P., Paull, R. E. & Rohrbach, K. G. (eds) (2003). The Pineapple: Botany, Production and Uses. CABI Publishing, Wallingford, UK. Kiple, K. F. & Ornelas, K. C. (eds) (2000). The Cambridge World History of Food, Volume 2. Cambridge University Press, Cambridge, UK. Morton, J. (1987). Fruits of Warm Climates. Florida Flair Books, Boynton Beach, USA. Linares, E.L., Galeano, G., García, N. & Figueroa, Y. (2008). Fibras vegetales utilizadas en artesanías en Colombia. Artesanías de Colombia S.A. , Instituto de Ciencias Naturales-Universidad Nacional de Colombia. Berhaut, J. (1988). Flore illustrée du Sénégal 9: 1-522. Gouvernement du Sénégal, Ministère du développement rural direction des eaux et forêta, Dakar.